m. Edith Whittaker (b. 1870, Nottingham) abt. 1890, Derby. Harold F. served in the Great War in the Royal Engineers. World War 1 medals included Victory and British medals. At some stage he achieved the rank of Acting Company Quartermaster Sergeant. The London Gazette for Friday June 28 1929 records the appointment of Clerk of Works QMS H F TUNALEY as Lieutenant (Surveyor of Works) in the Corps of Royal Engineers. January 1942 - Major 29/6/1941; April 1946 - Temporary Lieutenant Colonel; 28/11/1945 A.R.I.C.S. ; April 1949 Quantity Surveyor. 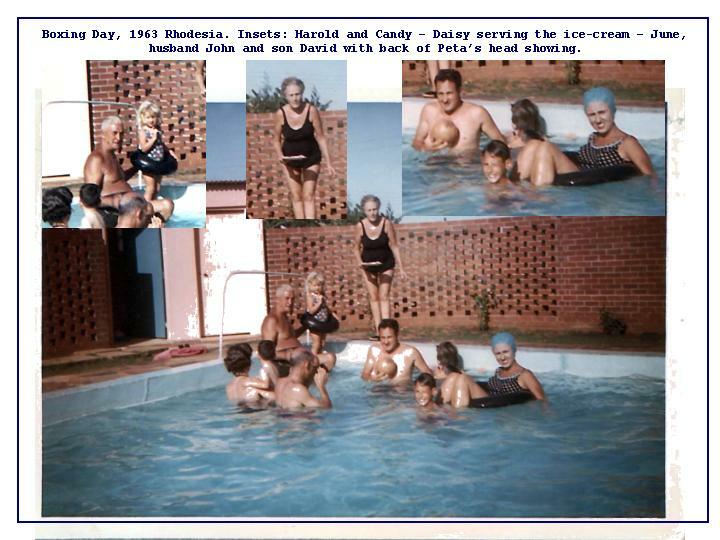 The Times Birthday Honours list for June 12 1958 records: Harold F TUNALEY awarded the Order of the British Empire under the Colonial Office list for public service in Northern Rhodesia. 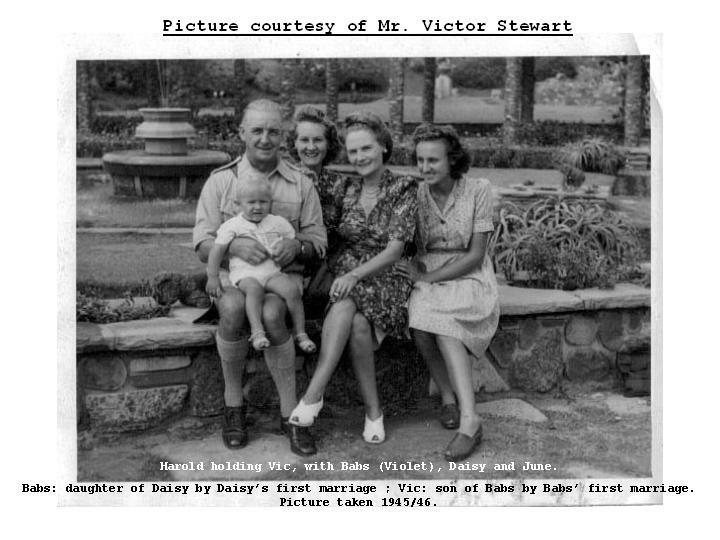 Passenger Lists: H.F. Tunaley, born 1892 male, 1952 London => South Africa Durban (Port Natal).Passenger Lists: H.F. Tunaley, born 1891 male, 1959 London => South Africa Cape. 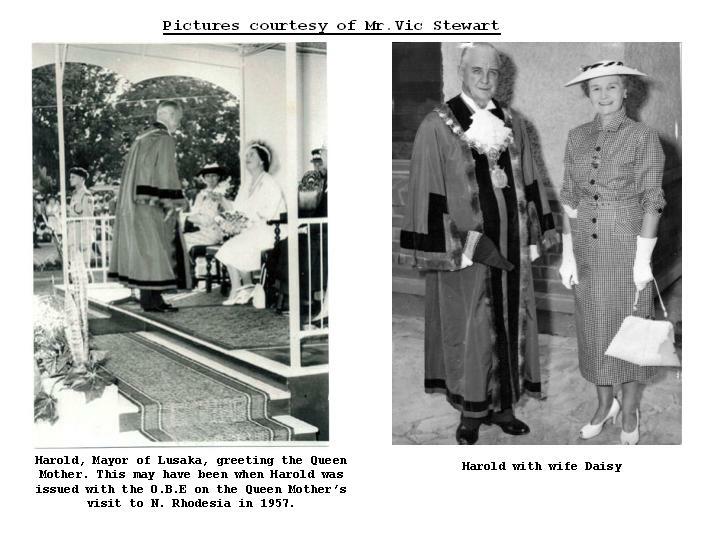 Records show Harold Frederick Tunaley, was an OBE, FRICS, E.Inst.D.and Mayor of Lusaka 1957-58; Royal Engineers (retd).He was also a senior partner in the firm Northcroft and Tunaley Ltd (Chartered Quantity Surveyors) Lusaka, Zambia (formerly Northern Rhodesia). Information and photographs courtesy of Victor Stewart. b. Derby 1891, c. 2/8/1891, Osmaston, nr. Derby. m. Daisy Watson, Port Said, Egypt, 11/2/1926. 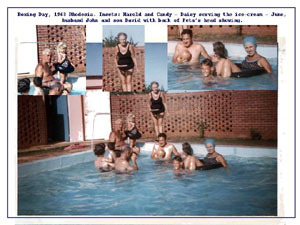 (Harold d. Salisbury, Rhodeasia. Daisy d. U.K. - dates currently unknown). Harold d. Lusaka, abt. 1968. Daisy d. Colwyn Bay, U.K. February 6th 1990 at the age of 97 years. Hilary June (known as June) Tunaley b. Ismailia, Egypt, 1927. (John b. Benoni, South Africa). Queen Elizabeth II's 1958 Birthday Honours List published June 3rd: Lieutenant-Colonel Harold Frederick Tunaley appointed Officer of the Order of the British Empire (OBE) for public services in Northern Rhodesia. m. Henry Tunaley abt. 1890, Derby. Edith d. Amersham, 1950, aged 80 years. 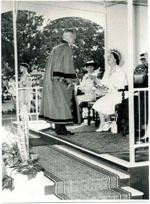 Below: Harold Frederick Tunaley, Mayor of Lusaka, being presented to the Queen Mother, 1957. Information and photograph courtesy of Victor Stewart. Click here or on picture to enlarge. Information and photograph below courtesy of Mr. Neil Davenport. Further detailed information courtesy of Mr. David Broom of South Africa.